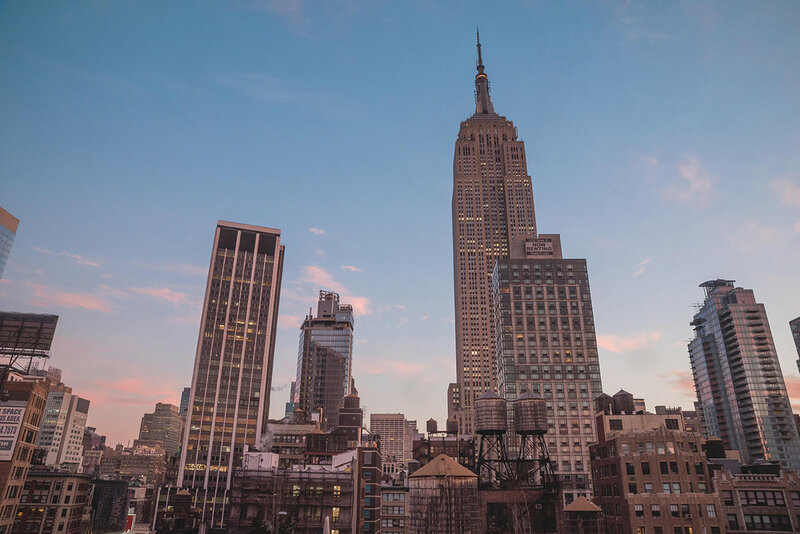 We headed out on the Thursday, arriving into JFK in the afternoon, just in time to catch an incredible sunset over Manhattan, while sampling the mad traffic on the 40 minute drive to where we were staying - Ace Hotel New York. There was a few of us on the trip; Joe from NB, myself and Rob, Zack from END., and Ethan and Sam from JD, and that evening we headed out for some food and beer and caught up with a couple of friends also. Check my Instagram Story here for all that we got up to. We were leaving on Saturday night, so we only really had Friday and Saturday to make the most of our time there, as well as the commitment of some filming at the New Balance Flatiron Store and then the 574 event in the evening. Kicked Saturday off with an early start, breakfast, filming, some retail (Noah and KITH), and then myself and Zack headed to the Brooklyn Bridge to try catch sunset and the Manhattan Skyline from Dumbo. Check out some images below from sunset! Confident we could do it in much less time, off we went back to the hotel, making it just in time to grab a couple of beers with everyone and then head out to the event. However, this time we caught the subway as we were already running pretty late, and that's not always a good look. The event was being held at Esther & Carol, and featured a free bar, as well as a performance from Raekwon (rocking the Friends + Family 574 as well as the coach jacket) on his birthday, cake and all! It was great to catch a few guys from a tight-knit Facebook group I'm on who live in NYC, and I was lucky enough to meet them the first time I was in NYC three years ago. To be honest, it's pretty incredible the power of social media and sneakers. The rest of the night was filled with plenty of booze, and that's all there is to say about that! It was Saturday, and that meant we only had the first half of the day before we had to leave for the airport. Determined to get as much pancakes as possible, we went all out at a diner not far from the hotel, then hit up some more touristy spots and copious amounts of coffee. After more coffee and a snack break, we had just about enough time to hit one more spot, so we caught the subway again (got a bit tired of trying to buy single ride cards from those daft machines), and headed to Brooklyn to that well-know tourist spot that looks at the Manhattan Bridge. Clearly we're a bit obsessed with the Brooklyn Bridge combined with sunset, but when you're right next to it, it just makes sense, right? Thanks as always to New Balance for having me, the trip was incredible! Stay tuned for when the film appears.